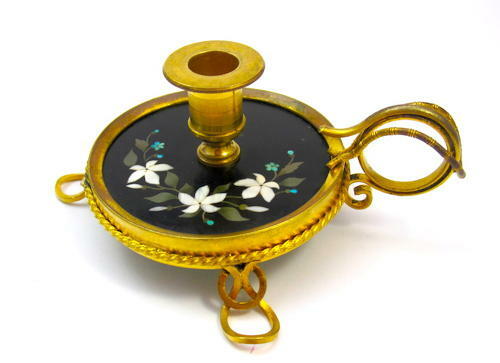 Antique French 19th Century Pietra Dura Candleholder. Pretty Candleholder with Dore Bronze Mounts and Pietra Dura Panel Decorated with Beautiful Hard Stones Depicting White and Turquoise Flowers. The Panel is Made of Dark Onyx. Lovely Dore Bronze Mounts, Double Loop Handle, Rope Surround and All Supported on 3 Scrolled Feet. The Pietra Dura are Intact, No missing Stones or Cracks.